Revisions to the city’s dockless vehicle pilot program, a response to complaints of scooter-strewn sidewalks and unsafe riding, are on the City Council’s agenda for its Thursday meeting. If the recent discourse between council members and Mayor Ron Nirenberg are any indication, they will overwhelmingly be approved. » Hours: People can only ride e-scooters from 6 a.m. to 11 p.m.
» Making space: Dockless vehicles can be removed from areas for “special events, construction, maintenance work” being done by the public improvement district (contract employees of Centro San Antonio formerly known as Amigos) at the discretion of John Jacks, director of the Center City Development and Operations (CCDO) department. The city estimated the latest measures will cost approximately $154,500, for bolstering enforcement personnel, educating the public about the rules, and for modifications related to designated scooter parking. In mid-January, Uber-owned Jump launched on downtown streets, joining the list of companies—Bird, Lime, Razor and Spin—with dockless vehicle permits. Jump received a permit for 4,000 vehicles—2,000 e-scooters and 2,000 e-bikes—which hiked the total number of permitted vehicles to 14,100. City officials, at the time, estimated there were 9,500 actual vehicles in operation throughout San Antonio. The next week, the council’s Transportation Committee placed a cap on new permits. This left out ride-share giant Lyft, which had just applied for a permit for 2,000 e-scooters. Spin, which was granted a permit for 500 rides before the moratorium was placed, has not deployed. The six-month pilot program, which the City Council approved in October, ends April 19. That’s when the city will consider more restrictions, according to the agenda. For example, the city may select the companies that can operate—which, in municipal nomenclature, is a process called a request for proposals—rather than stick with the free-for-all system currently in place. The city could also consider prohibiting scooter use on sidewalks, according to the agenda. 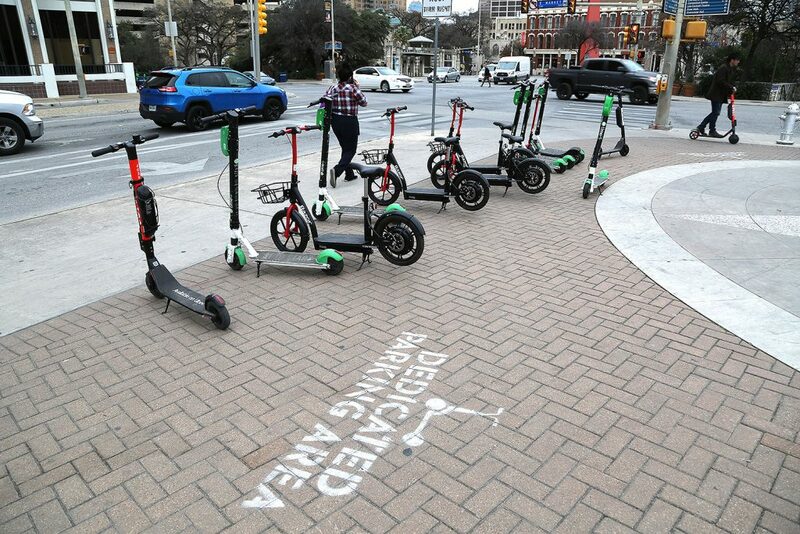 The use of geo fencing, a technology that would render a scooter inoperable in prohibited areas such as Alamo Plaza or the River Walk, is another possibility. Read the city’s agenda for other potential regulations. In the meantime, city officials have been designating more parking zones via stencil on sidewalks where there’s ample space, such as near the Henry B. Gonzalez Convention Center and on West Houston Street. Jacks has said in previous interviews that select metered parking spaces could be turned into scooter parking “corrals” that would incorporate some kind of barrier. Pedestrians can report improperly parked scooters on its 311 app. 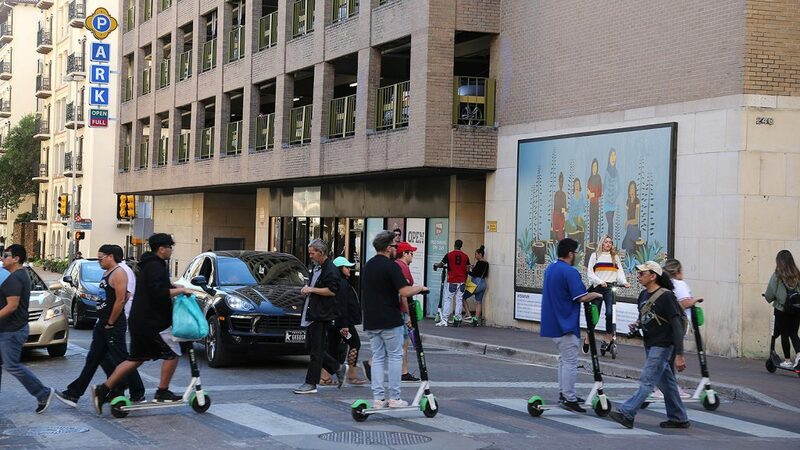 The city of San Antonio is also seeking feedback on e-scooters through its SASpeakUp website. Since the end of 2018, public officials have been pushing for more tweaks to the pilot program. District 1 Councilman Roberto Treviño pushed for the scooter reporting feature on the 311 app. Even Nirenberg, who lauded the program when the council approved it in October, took a cautious step back recently.